On November 13, 2018, State Councilor and Foreign Minister Wang Yi and Foreign Minister Heiko Maas of Germany jointly met the press after holding the fourth round of China-Germany Diplomatic and Security Strategic Dialogue, and introduced the outcomes. 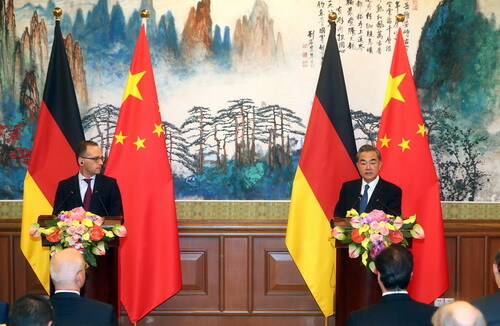 Wang Yi expressed that China and Germany share strong cooperation complementarities and many common interests. Bilateral relations have maintained high-level development momentum. Both sides agreed in the dialogue that the two countries, as all-round strategic partners, should regard each other's development in a more positive manner, increase political mutual trust, focus on common interests, and accommodate each other's concerns, so as to set an example for the new type of relations between the major countries in the new era. China and Germany, as two major countries with world influence, enjoy strategic relations that have gone beyond bilateral scope, and shoulder significant responsibilities in maintaining world peace and stability as well as promoting world prosperity and development. Wang Yi noted that the Chinese side and the German side believe that we should unequivocally stick to the path of multilateralism. At present, the world is going through complicated and profound changes. The resurging of unilateralism and power politics has brought many instabilities and uncertainties. In this context, it is necessary for China and Germany to maintain the stability of bilateral relations in the first place, and well safeguard the overall stability of the international situation and overall interests of all countries in the meantime. The Chinese side supports Germany in playing a positive role as a non-permanent member of the United Nations (UN) Security Council for the term 2019-2020, and stands ready to, together with the German side, enhance communication and coordination under the frameworks of the UN Security Council and the G20, and maintain the order of multilateralism with the UN at its core. Both sides believe that we should unswervingly safeguard global free trade system. Since both China and Germany are the beneficiaries and supporters of free trade, the two countries have, for a long time, adhered to two-way opening up and constantly made the pie of our cooperation bigger, becoming a successful example of mutually beneficial cooperation between developed countries and developing countries. Faced with the de-globalization trend and resurgence of trade protectionism, both the Chinese side and the German side have sent, and will continue to jointly send out clear messages of safeguarding free trade and opposing protectionism. Both sides believe that we should boost the overall revitalization of Eurasia through mutually beneficial cooperation. As China and Germany are two important economies located at the two ends of Eurasia, strengthening cooperation between the two sides is conducive to advancing the common development of Eurasia. Given that the economic circle of Germany has shown great enthusiasm for participating in cooperation under the Belt and Road Initiative, we welcome German enterprises to take part in the projects of the Belt and Road Initiative as well as carry out third-party cooperation in the countries along the route under a suitable condition. The Chinese side welcomes German leaders to take part in the second Belt and Road Forum for International Cooperation to be held next year. The Chinese side hopes to see the European Union (EU) stay united, stable, open and prosperous, and will continuously firmly support the integration process independently chosen by Europe itself. China is willing to reinforce the integration of the Belt and Road Initiative and the Europe-Asia connectivity strategy which is put forward by the EU, and accelerate the negotiations on China-EU investment agreement. Both sides believe that we should strengthen strategic communication to jointly cope with global hotspot issues and challenges. China and Germany are important stabilizing forces in the world. Just now I exchanged in-depth views with Foreign Minister Heiko Maas on hotspot issues such as the situation on the Korean Peninsula and the Iranian nuclear issue. We have agreed to continuously make unremitting efforts to promote dialogues and negotiations between all parties concerned on the Korean Peninsula and safeguard the effectiveness of the Joint Comprehensive Plan of Action. Both sides will also carry out further cooperation in such areas as tackling climate change, refugee, and terrorism.